The maiden laps of the BMW Sauber F1 Team's new car went off according to plan. 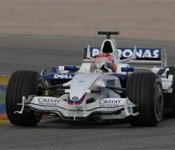 The doors of the pit garage opened at 12.00, and seven minutes later Robert Kubica emerged with the BMW Sauber F1.08 for its first installation lap on the Valencia circuit. BMW Motorsport Director Mario Theissen was clearly satisfied: "The roll-out of the BMW Sauber F1.08 went-off absolutely hitch-free. All systems were functioning from the word go and Robert has gained a positive first impression of the new car's handling. It means the most suspenseful moment for the engineers and technicians has resulted in a positive outcome. In the next few days we will be testing the technology in detail before tackling the job of further honing the BMW Sauber F1.08 for performance." It was the first time that Kubica had been given the honour of taking a Formula One car out on its maiden drive. The Pole enjoyed the task, commenting: "It was a good start. I've only driven a few laps so far, but I have the impression that everything is heading in the right direction. The car feels more stable than its predecessor and it builds up more grip. I'm looking forward to the test days to come." His team-mate Nick Heidfeld had already taken the car out on a few demonstration laps at BMW Welt, the company's futuristic-looking delivery centre in Munich. In Valencia he drove the F1.07 on Tuesday, and Thursday will see him at the wheel of the F1.08. "I really enjoyed driving the old car as well," said Heidfeld. "During the winter break there were a few weeks when I hadn't been in the car. The F1.08 is the most beautiful vehicle I have seen in my F1 career. It has a lot of interesting details. I'm really excited about getting inside it on Thursday!" Technical Director Willy Rampf appeared both satisfied and relieved: "The entire team has been looking forward to this day with feverish excitement," he explained, "and we are all accordingly delighted to have encountered no problems whatsoever on the first outing with this completely new vehicle. Now all the car's systems and entire sensor technology will be checked in detail before the start of the further test programme."